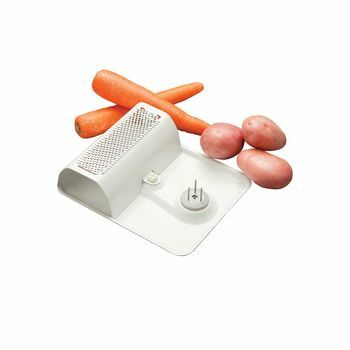 Clyde Grater & Scraper - Designed for one handed peeling and grating, or for those with arthritic hands. White epoxy coated steel frame with a plated metal mesh blade for grating. Stainless steel spike section for securely holding vegetables in place for manual peeling. Smooth ended spikes for safety. The top section is easily detached for cleaning.